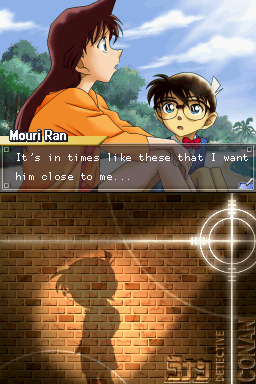 Meitantei Conan & Kindaichi Shounen no Jikenbou: Meguri au Futari no Meitantei is an adventure game for the Nintendo DS. 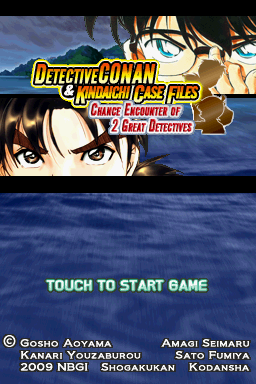 Detective Conan & Kindaichi Case Files: Chance Encounter of 2 Great Detectives is a Nintendo DS video game developed by Namco-Bandai Games. 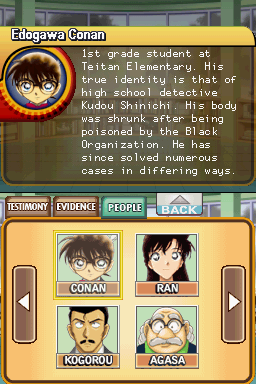 Considered by many to be the definitive Conan game, it marks the first occasion that Japan’s two most beloved anime-manga detectives crossed paths. 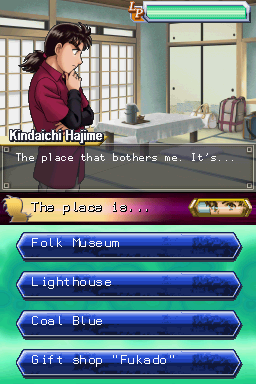 Originally released in Japan in 2009, years passed with no word of an English localization. 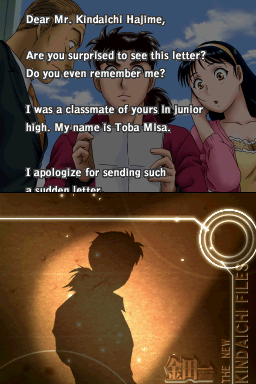 Acknowledging it was unlikely that not only this game but most–if not all–future Detective Conan games would similarly never see English releases, we at DCTP decided to try our hand at translating the full game for everyone to enjoy. After many years of work, we are proud to announce the complete English patch is finally complete and available for download!